250 pages | 19 B/W Illus. Shadow banking – a system of credit creation outside traditional banks – lies at the very heart of the global economy. It accounts for over half of global banking assets, and represents a third of the global financial system. Although the term ‘shadow banking’ only entered public discourse in 2007, the importance and scope of this system is now widely recognised by the international policy-makers. There is, however, much less consensus on the origins of the shadow banking system, what role it plays in global political economy and the optimal approach to regulating this complex segment of finance. This volume addresses these questions. 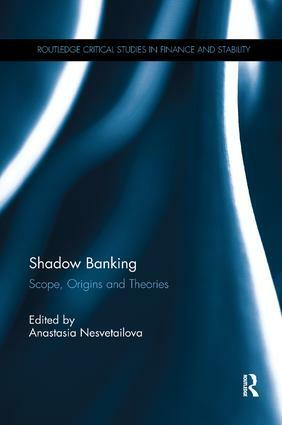 Shadow Banking is the first study to bring together the insights from financial regulators, practitioners and academics from across the social sciences. The first part traces the evolution and ongoing confusion about the meaning of ‘shadow banking’. The second section draws major lessons about shadow banking as posed by the financial crisis of 2007–09, providing comparative analyses in the US and Europe, and attempts to establish why shadow banking has emerged and matured to the level of a de facto parallel financial system. Finally, the third part goes beyond current regulatory concerns about shadow banking and explains why it is ‘here to stay’. This volume is of great importance to political economy, banking and international political economy. Anastasia Nesvetailova is Director of City Political Economy Research Centre, City University of London, UK. Her main research and teaching interests lie in the area of international political economy, finance and financial crises, regulation and governance.